For fear of too much/too little/getting it wrong, some of us, who know we are going to give a gift anyway, delay. Then it's the lacklustre gift basket stuffed with odds and sods, few of which are very good. I once read a funny piece about Christmas gifts from the 7-Eleven, but we can do better. Where to go when panic strikes? My nominations for Best Last-Minute Gifts (Adult Division), below. Options given for your local vendor or the big names, who pack professionally, gift wrap and offer express delivery. 1. Buy fresh new essentials from your local kitchenware boutique or an online seller like Williams Sonoma. Most of us let our housewares get grungy, and new ones are far down the replacement list. Grab a handful of spiffy implements, a cutting board or good paring knife; throw in a linen dishtowel. Stay away from weird-flavoured oils and overpriced dish detergent in scents like gingerbread. 2. In northern climates. something down. 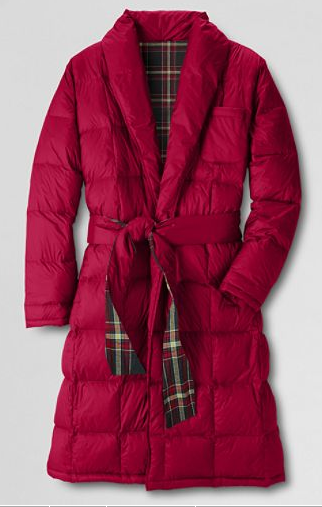 You cannot have too much down in a cold snap, and if you take that to hea(r)t this minute and get fast shipping, you could score a snuggly Land's End Flannel Lined Down Robe (Price, $150.) It's hiding in the mens' section but an be worn by women too. Love the northwoods vibe. Bet you thought I was going to suggest a spa gift certificate. If you know someone has a favourite place and treatment, okay– but then you are not panicked. 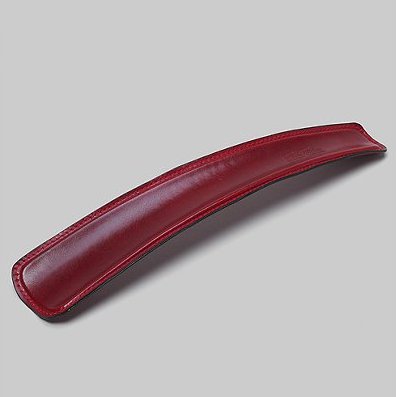 Think beyond fragrance or makeup to find those finely-crafted items that are useful, but also a treat: A real horn shoe horn, a German nail-clipper, a lighted vanity mirror, or for big budgets, a luxe washable cashmere blanket. Drop by your local haberdashery, best drugstore or salon, or follow the links to online vendors. 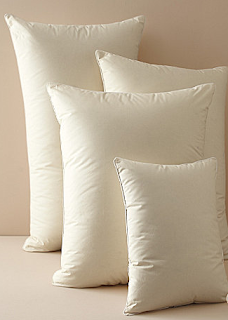 I love to sleep on good pillows and they've always been happily received as gifts. A little knowledge of sleeping habits helps; a peek in the bedroom will reveal whether you're buying standard or a larger size. If unsure, a small boudoir pillow is a pretty treat for madame, especially if offered in a charming case. Go to your nearest department or linen store, or order online from Garnet Hill or other vendors with fast shipping. Price, $50 and up. 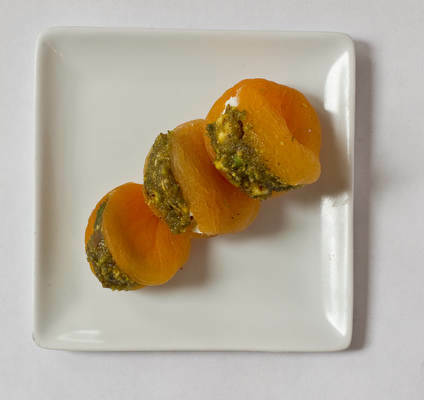 Zingerman's, the online purveyor of fine foods, offer three-month or six-month shipments. And you don't even want to know about their Forbidden Foods Club. You could design your own version, making the faithful deliveries yourself. A friend did this with Cheesecake of the Month for her daughter and son in law. A lace headband and/or eyemask: Why not be the aunt who gives something not really, uh, sporty? Or the lover? These accessories are available from aptly-named eBay seller just4fungifts and you can get express shipping. 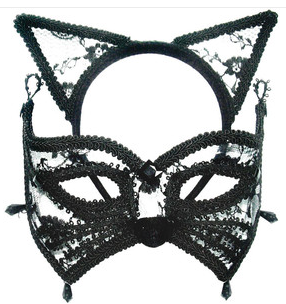 I've also seen these at local craft shows, scooped up by young women who plan to wear them to New Years' Eve parties, concerts or just because they can. If I have saved one person from receiving a drab gift card, my work on this planet is finished. You might also file these ideas for other occasions, as they are not especially Christmas-centric. PS. Back for another year: Here's my Spiced Nut recipe, which knocks it out of the tree lot: quick, delicious, luxurious and so easy that you can make it with a child. All great ideas, as expected. But the real treat was remembering all our visits to Zingermann's--we used to live near Ann Arbor and ate many a sandwich in that tiny hole-in-the-wall (circa 1986). These are inspired. 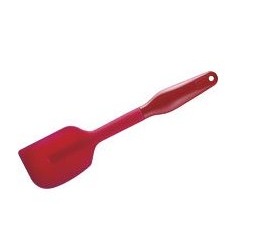 I love the idea of the kitchen utensils; you're right that people don't often replace their own until broken. This is a great series of articles. Duchesse, you have answered a few of my pressing gift issues. I was needing a few additional ideas for a particular friend and something small yet thoughtful for my husband. He's a stickler about caring for his clothing and his personal grooming so your upmarket suggestions are appreciated. Great ideas! Your giftees are lucky folks indeed! Are you implying I ought, with very little purchased, to be panicking? There are some lovely ideas there. By the way, the "h" is missing from the beginning of the clipper url, if you haven't repaired it yet. I mention that because I loved poring over tweezers, clippers and such. I don't know of any shops that sell good ones any more; long ago they were available at the glass counters of department stores, as were good-quality combs. Your all-important "nibbles" url is also missing some element. I noticed that the cashmere blanket comes only in queen and king. Guess all their giftees have large bedrooms. I cannot use that link as Blogger says I must be invited! great thoughts on gifts Duchesse. Deja Pseu has a similar post, great minds think alike! I really like the idea of giving kitchen utensils. In fact maybe we'll give some to ourselves :). Oh Duchesse, I can't access the nuts recipe and I am in need! I don't have a family and most of my friends are Jewish so Christmas isn't that big a thing for me, but one or two do have trees and have even hidden them behind curtains from the Rabbi! Bourbon and hostess: I've edited this post to include the recipe. Your spiced nuts sound yummy--I will definitely be trying them! 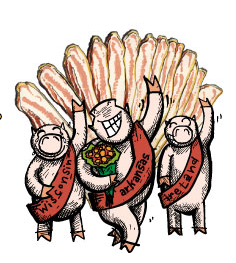 Oh--and three cheers for Bacon-of-the-Month; the catalog alone is a hoot, and the bacon is delicious. Great ideas! Little luxuries that make life easier, more pleasant, or tastier. Another nice gift for girly-girls is a new set of make-up brushes. A foundation brush, a big soft one for blush/powder, one for eyeshadow, and a retractable lip-brush are all good basics. Rubi: I'd love to get that! Thanks.